Planning a project is important, but it’s nothing to get stressed out about. In fact, the more anxious you are about managing a project, the less likely you’ll be able to control it. It’s really that simple, but you’re not done yet. Now you have to work on expanding the ideas behind those three parts of the project planning process. To do this you’ll want to have the right project planning tools to assist you. 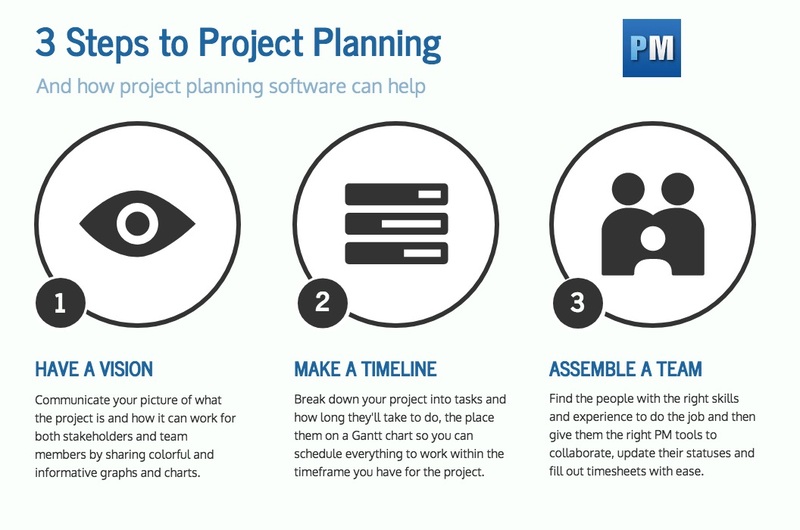 For each of the three steps there is project planning software that has features to help you plan more efficiently. Let’s take a deeper dive into the three steps outlined above to learn how to effectively plan a project. The project vision is a way to paint a picture of the project. Remember that the vision is vital for getting stakeholders on board with approving your proposal. If you can’t show them the business opportunities inherent in the project and convince them that you have a clear path from start to finish, nothing is going forward. So, you have to know what it is you’re building or delivering for the project. What will be the end result of the plan? What are your primary objectives and deliverables? Most importantly, why is it important for this plan to succeed? Once you have answers to those questions then it’s time to communicate your vision, first to stakeholders to approve the project, and then to your team to execute it. There are several ways to communicate your vision, but the vision is often formally written into a document called the “business case.” Having a formal document is a good way to establish trust and credibility with project sponsors and key stakeholders, and it’s also helpful to share this document in early draft form with key decision makers, to make sure you have buy in on the vision. But for your team, you’ll want to have a separate format for sharing the vision of the project. Depending on the nature of the project, you might create visual presentation boards, or call them in to a whiteboard session and define the key objectives more informally, but whatever format you choose, be sure to help the team understand how your vision for the project ties into their professional goals and the overall strategic objectives of the organization. You’ll need their buy-in, too. You timeline is the project schedule. What is a project schedule? It’s made up of all the tasks on your timeline, each with a start and finish date. This is the clock of your project plan, ticking away the time you have to complete the tasks that build the goal of your project. It’s important that you keep to your timeline and plan accordingly so you can have a bit of wiggle room in case things take longer than you’ve planned. Once you’ve wowed the stakeholders with your great idea, now you have to take the objectives and deliverables you defined in your business case and turn that into a realistic schedule. That means taking the project and breaking it down into tasks, smaller jobs that lead to the end result of your project. You’ll want to start with a simple list detailing everything you can think of, and then prioritize them to see what is critical to the success of the project, and what can be dropped if necessary. Then you’ll want to estimate how long the tasks are going to take. You’ll want to define each task’s duration, and set a start and end date, to establish an overall timeline for the entire project. These might change, of course, especially once you engage your team to help you with task estimates, but setting a project baseline is an important first step in defining the timeline for the project. Once you have your tasks and their duration, you’ll need to determine if any are dependent on another. These are called task dependencies, and they are tasks that cannot start until another has been finished. Obviously, this can lead to team members getting blocked and taking a project off-track, so you want to be aware of where these issues might occur and provide a way around them become a problem. Another thing to take into account at this phase in the project planning process is milestones. A milestone marks a major phase of the project being completed, whether that’s a series of tasks that end a big phase of the project or the completion of your project plan. Milestones are usually symbolized by little diamond-shaped icons on your schedule. Now you need the resources to execute the schedule to achieve your vision for the project. Those resources can be anything from the office space you need to do the work to the planning project software you employ to manage the job. But the most important resource are the people you assemble to do the tasks. First you need to know the skill sets required of each team member to fulfill the demands of the project, and then you have to find the people who have those skills and the experience to accomplish the work within your budget and deadline. At this point you might want to invest in training to bring your team up to speed with the requirements of the project. While this may seem like extra work, it can give your team members the tools they need to do the specific tasks you assign, and it creates buy-in to the project and develops team loyalty. Don’t forget to find out their schedules. Team members may have other jobs or vacation time during crucial periods of the project. You want to make sure they have the time open to commit fully to the project, as well as planned holidays defined so you can allocate work according to their availability. Once you have the team together it’s a good time to revisit the vision part of your project planning process. Give them the big picture talk, and make sure you show them their place in that picture. You need the team on board with the vision of the project as much as you need approval from stakeholders to get the project done right. These steps are broad, to be sure, but they offer a pathway through the planning process and orient you in the right direction. But the job is made infinitely easier with project planning software as opposed to using Excel or sticky notes on your desk. Project planning software, also called project management software, allows you to automate your schedule so that it updates in real time when your team updates their tasks. When you manage in real-time, you stay on top of roadblocks and are able to steer the project forward. For each of these steps, software can make the job a little easier. For Step 1, create your vision document or images and share them with the stakeholders and your team in the PM tool, so they can access them whenever they need to. You can also use collaboration features in the tool to get feedback, have discussions and keep the team engaged in the project vision. 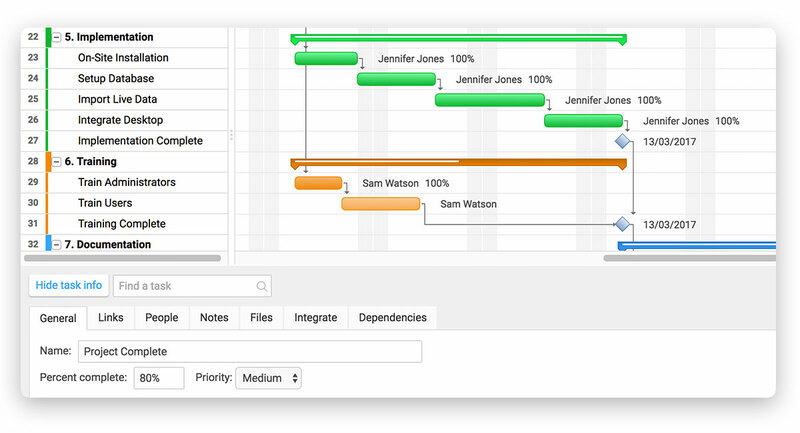 For Step 2, a project timeline can be created starting with the task list and you can simply drag a task bar on the Gantt chart to extend its due date. That way you can see visually, where one task ends and another begins. Plus you can assign them to team members and they can get email alerts when tasks change, are due or when another task is complete so their dependent task is ready to be worked on. Finally for Step 3, you can invite team members to the PM software, add their work availability, define their skills and assign them work. And you can also track their costs so you always know whether your project is on budget. Planning a project is the foundation of project management. You want online PM tools that can communicate your vision, schedule your tasks and collaborate with your team when executing the plan. The cloud-based ProjectManager.com does all that and more. Take a free 30-day trial today.